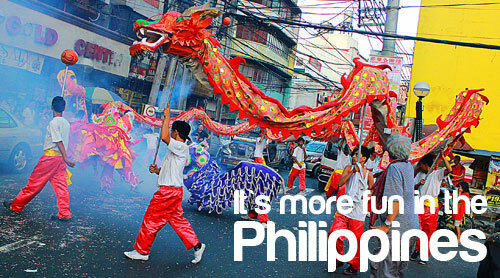 Chinese New Year in the Philippines is one of life’s natural highs. Walking through Manila’s Chinatown during New Year’s celebrations is an experience in itself. It’s colorful, aromatic with the smells of burning incense permeating the air, the pungent spices the ingredients enhancing the many exotic meals prepared and served for this very special occasion. Chinese New Year is a celebration of the senses; the many dragon parades whose tails span entire city blocks, the noisy gongs, loud bells and clinging symbols making a joyful din reminding residents and tourists alike of the mysterious and exotic Middle Kingdom we call China. In Manila’s Chinatown Oriental arts and culture come alive with a particular character during the celebration of the New Year. Each year commemorates its own special animal borrowed from the Chinese Zodiac. 2016 has been designated as the Year of the Monkey. Some of the finest Chinese and other Asian restaurants do a brisk round-the-clock business serving meals familiar to most non-Chinese as well as some pretty exotic fare known only to local gourmands. Whenever I visit Manila during Chinese New Year I always bring along extra rolls of film to capture and preserve the highlights of this happy season so that I can enjoy them when I get back home alone or among family and friends. I generally prefer the ‘old’ 35 MM film, though last year my wife brought me an I-phone from T-Mobile as a birthday gift to update my technology. During new year restaurants serve mouth-watering meals that are both delicious to the taste and inexpensive on the wallet. The American dollar still goes a long way in the Philippines and other parts of Asia though Mexico’s the best bet these days with its devalued peso. And here’s another plus about visiting Manila’s Chinese district; it’s relatively safe; beware of pickpockets. The twelve times I visited Manila’s Chinatown I had no problems going from store-to-store either buying stuff or perusing the premises. Unlike here in Chicago or other third world nations I wasn’t hassled by street children, homeless people, or hooligans who prey on defenseless tourists. The people treated me as one of their own. In all my travel articles I warn people: Don't look like a ourist! When visiting certain places, Manila in particular Dress Down. And don’t go it alone. There’s an active press corps roaming around Chinatown during new year; seeing your camera dangling around your neck people might mistake you for a roving press photographer so you’re okay in that regard. Suggested attire: jeans, plain shirt, sneakers are in. Loud Hawaiian shirts, short pants, expensive shoes, Rolex watches, stand out hats are out. Use common sense. Blend in with the crowd. Be part of the passing parade not a grim statistic. What started Chinese New Year? Nobody really knows for sure when the ancient Chinese first celebrated their version of the New Year. But we do know this, in China and every place on the planet where there’s a sizable number of ethnic Chinese it is celebrated in a very big way and in some places a national holiday. According to Wikipedia: Traditionally, the year was said to have begun with month 1 during the Xia Dynasty month 12 during the Shang Dynasty and month 11 during the Zhou Dynasty. However, records show that the Zhou Dynasty began its year with month 1. Intercalary months, used to keep the lunar calendar synchronized with the sun, were added after month 12 during both the Shang Dynasty according to surviving oracle bones. The Zhou Dynasty according to Sima Qian the first Emperor of China Qin Shi Huang changed the beginning of the year to month 10 in 221 BC, also changing the location of the intercalary month to after month 9. Whether the New Year was celebrated at the beginning of month 10, of month 1, or both, is unknown. In 104 BC, Emperor Wu of the Han Dynasty established month 1 as the beginning of the year, where it remains. Chinese New Year like Ash Wednesday, Holy Week and Easter Weeks on the Christian calendar, Muslim Ramadan, the Jewish High Holidays and many other special days religious and secular they are all moveable feasts. They fall on different dates depending on the lunar cycles and a number of other factors. Many Chinese avoid making any major decisions and hold back business negotiations they’re being in a ‘holiday mode’ until after the holiday. In many countries a statutory holiday is added on the following work day when the New Year falls on a weekend. In some places the actual celebrating starts before and after the official holiday in similar fashion as the Pre-Lenten Carnival (Mardi Gras). Watch where you walk; Manila’s Chinese district has some of the worse streets anywhere. Potholes are large, large pieces of concrete, uncovered sewers without protective grates one misstep you can fall through rusty jagged metal edges into rivers and streams so polluted that, if you managed to free yourself, a battery of inoculations will be required as not to catch a myriad of diseases that lie lurking in filth infested waters. Like I’ve said in previous writings the Philippines possess an uncommon beauty rarely found in other countries however it's not without its dangers. It's not my desire to frighten potential visitors to the Republic but it is this writer’s duty to tell the whole truth not just the pretty parts. Chinese New Year is a must do event for my family. My wife and I center our holiday in conjunction with this joyous event whenever we always go ‘back home’ (Philippine Islands) weeks before the actual holiday. The Philippine version of this popular time is celebrated with certain festive foods. · Asado siopao: is filled with diced pork/beef cooked in soy sauce with salt and pepper to taste. · Bolo-bola: is a Chinese-styled filling that consists of chopped pork, Chinese sausage, all baked with egg and flour. Both siopao meat filled buns are served with a sweet asado sauce a mixture of soy and oyster sauces simmered with brown sugar; delicious! Here’s a popular Chinese New recipe you should enjoy; this is the recipe for Salmot Shao Mai. The author-chef of this dim sum dish is Ms. Kate Heyhoe (Kate’s Global Kitchen) who wrote this popular dish for the Global Gourmet. This is an appetizer for 4 people and can be considered at light meal. 1. Mix together all salmon filling ingredients. If desired, reserve 1 teaspoon minced green onion top for garnish. 2. Lightly dust a work surface with cornstarch. 3. On the work area, set out four wrappers. Cover the remaining wrappers with a damp towel to prevent drying out; spoon 1 heaping tablespoon filling in the center of each wrapper. Brush the surrounding wrapper surface with water. For each wrapper, crimp the sides up in 4 places, to make a square, pleating the excess dough and leaving the top exposed. Make 4 more pleats to form an 8-pointed star, and push the filling up from the base so it forms a mound. (See the notes for more details). 5. Fill the steamer pot with enough water to come just below the steamer rack. Cover the pot (without the rack inside) and bring the water to a boil. Prepare a bamboo or metal steamer rack by lining it with parchment paper or lettuce leaves. Arrange the dumplings about 1 inch apart on the rack. When the water boils, carefully remove the lid and place the rack in the steamer. Cover and steam about 7 minutes, until the dough and salmon are just cooked through. (Overcooked dough becomes mushy, and overcooked salmon dries out). 6. While the dumplings steam, mix together all ingredients for the Dipping Sauce. 7. Garnish the salmon tops as desired. Serve the steamed dumplings with the dipping sauce, either in one communal bowl or as small individual bowls per person. This dish should go well during the meatless Fridays of Lent. We ended our day dining in one of the many family style restaurants in the Chinese district. What we had I can’t remember. All I know was that it was delicious, nine courses, inexpensive, and more than what we could eat during a single sitting. We doggie bagged the rest. One more thing don’t ever DRIVE through Chinatown anytime especially during new year. The place is overcrowded as expected during the annual festival. Do what we do and hire a professional driver (chauffeur). They know where to park, the best places to eat and watch the show, plus they have driving skills we Americans can scarcely imagine. The Philippines, like Mexico City, isn’t for the typical tourist. There’s a United States Department Advisory on the Philippine Republic that I strongly urge potential tourists to read thoroughly. God bless, be careful and see you next year in Manila!